Still photography is a powerful way to translate conditions and experiences between different cultures. I am motivated and dedicated to using my skills as a photographer to tell powerful and meaningful stories that evokes an understanding and/or action. The loss of your mother is a horrific experience that ultimately all of us will experience. Our family rallied to moms' side a few years ago when she fell and broke her hip. This series of images are taken throughout her convalescence and focus only on our hands. These images reflects the changes in hope, faith, desperation we all experienced as our mom's body continued to decline throughout the year. Initial there was so much hope and expectations that our touch and encouragement would allow her to find the strength to “hold on.” However, ultimately we had to come to peace with "letting her go." Images from this series were on display as part of exhibitions in Berlin, Germany and Vermont during 2016. They also received recondition in the following competitions, including: Bronze 2016 Prix de la Photographie (Px3) People Category as a series, 2016 Moscow International Photo Awards (MIPA) in the People/Family Category, and Third Place in the 2016 International Photo Awards (IPA) in the People/Family Category. I am so fortunate and privileged to meet Dr. Rebecca Kammer a doctor of Optometry that specializes in Low Vision Care. I met her during Bibiana's and Tindi's annual eye exam. Rebecca is impassioned, knowledgeable, precise, attentive and very giving with her time and knowledge. She spent a couple of hours with the girls’ exam and sharing a wealth of information about the varying eye conditions associated with Albinism. Rebecca is so committed to her giving back to the community, she has spent several years going to Tanzania to provide low-vision eye care, coaching and training to people with Albinism. She is the Director of Vision Services for a nonprofit known as Standing Voice whose state purpose is to “promote the social inclusion and well-being of marginalized groups.” This group has several health, education and advocacy programs for people with albinism in Tanzania in order to enhance and maximize their vision as well as their future. I am so excited to share that I will be going to Africa this November and one of the projects I will be photographing. Please go to the link below to learn more about Standing Voice and how you can participate and/or contribute. And you will really want to go to this second link to get a chance to meet Rebecca and be charged with her enthusiasm as I am. Observing the outcomes of the creative process is quite revealing. Bibiana and Tindi have been taking and enjoying painting classes and it is immediately evident that these two sisters paint from a different place. Bibiana’s work is measured and a study of creating beautiful images from nature. 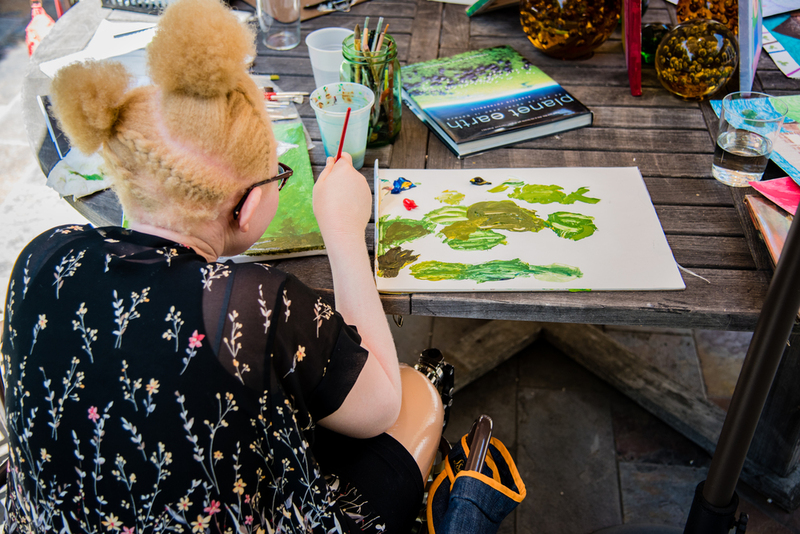 While Tindi’s work is prolific, drawing from images linked to life experiences growing up in rural Tanzania with the genetic condition known as albinism to strong women like Gloria Steinem. Her images can also be disturbing: with portrayals of good and evil witch-doctors, her childhood house on fire, a bloody machete, dismembered albinos, etc. One of her prominent images is an albino woman with her hand on her hip…when asked about this image Tindi explains that “she is looking forward to the day when people will look at this albino woman and see her as beautiful.” I look at this image and all I see is Tindi…you girls are beautiful. Thank you Kylie for sharing your gift with the girls. Until recently I knew very little about ‘Albinism.’ I live in the US and have had limited exposure to people with this genetic condition. This changed when I was introduced to Bibiana and Tindi. These teenage girls are from Tanzania and their dramatic life experiences have thrusted them into advocating a broader awareness for Albinism. I did not know that, while Albinism is a recessive gene, there are countries with a significantly higher occurrence of this condition. While the US has an occurrence of 1:200,000, countries like Tanzania have rates of 1:1,300. I did not know that there are places where Albino children are attacked and maimed for the purpose of harvesting body parts for profit. Tanzania is one of the countries that this superstitious practice is perpetuated by witch doctors and the ‘unknown’ source of funds. When she was 10, while her sister slept, vicious men yielding machetes attacked Bibiana during the night. Her right leg was severed above the knee and two fingers on her right hand were lost during this brutal attack. Bibiana spent almost a year in the hospital recovering from this violence afraid to return to her home in the Mwanza Provenance near the southern shores of Lake Victoria. News of this horrific attack spread throughout the country and caught the attention of the honorable Alshaymaa Kwegyir. Alshaymaa is a person with albinism, yet she grew up with loving and protective parents. Therefore she did not suffer abhorrent discrimination, stigmatization and even murder. This support formed a stable foundation for Alshaymaa to complete her education and go into a career of civil service and today she is a represented in the Tanzanian parliamentary. Bibiana’s story was so compelling Alshaymaa went to see her girls and ultimately obtained legal guardianship of Bibiana and her sister Tindi. Artist and activist Yrneh Gabon Brown brought the condition of Bibiana’s original prosthetic leg to the attention of African Millennium Foundation. Bibiana is now 16 and is in the US to be fitted for a new prosthetic leg. She is also conducting the physical therapy necessary to get her use to walking with a state of the art articulated prosthesis. Her original prosthetic leg had limited range of motion and reportedly served more like a “crutch.” Concerned citizens and organizations have teamed together to assist Bibiana and her plight including African Millennium Foundation, Orthopedic Institute for Children, and the Hanger Clinic. In addition Bibiana is working with a physical trainer and has been exposed to athletes and children with prosthetics in order to ensure she has a new outlook in life. It is inconceivable to imagine going through such a horrific experience, yet Bibiana is a survivor striving towards her future. Finally Bibiana’s story has inspired 13-year old Naria Slann to establish a fundraising effort called “A Sisters Village” to raise funds to send Bibiana and her sister Tindi to boarding school in the US. Naria wants to ensure that they have an opportunity to fulfill their dreams without the fear they experience at home. Go to the link below to provide your assistance to this worthwhile cause. I am so excited to share that the new photography work from Mozambique is getting positive feedback from several photo contests. Recently I had the pleasure of meeting and photographing two special girls. I would like to introduce you to Bibiana and Tindi two sisters from Tanzania. These girls have raised my awareness and outrage about the horrific mistreatment and maiming of people with Albinism in Tanzania. The NGO African Millennium Foundation (AMF) raised funds and leveraged connections to bring Bibiana to the US to be fitted for a new prosthetic leg. One of the clear messages these girls wanted me to convey is that they are ‘Not Ghosts we are Human Beings.’ These images are a testament to this fact…they are sweet girls with dreams and aspirations to continuing their education being the teenagers they are. The NGO African Millennium Foundation (AMF) raised funds and leveraged connections to bring Bibiana to the US to be fitted for a new prosthetic leg. Their story is powerful and has inspired others to action like 13-year old Naria Slann who established a fundraising effort called “A Sisters Village” to raise funds to send these girls to boarding school in the US in order to ensure that they have an opportunity to fulfill their dreams without the fear they experience at home. Please check out the gofundme site for more information about how you can help. Until just a few months ago I knew very little about the condition known as ‘Albinism.’ I live in the United States so I had limited exposure or interaction with people with this genetic condition. All this changed when I was introduced to Bibiana and Tindi. These two teenage girls are from Tanzania and their life experiences have thrust them into advocating a broader awareness for Albinism. - I did not know that while Albinism is a recessive gene there are countries and populations with a significantly higher occurrence of this condition. For instance while the United States has an occurrence of 1 in 200,000, countries like Tanzania have rates of Albinism of 1 in 1,300. - I did not know that in this day and age there are places where Albino children are attached and maimed to harvest body parts for profit. Tanzania is one of the countries in East Africa that this medical-spiritual practice is perpetuated by witch doctors and the ‘unknown’ source of funds that perpetuates this evil practice. Bibiana was attacked during the night after she lost her father to AIDs with men yielding machetes when she was only nine/ten with her younger sister Tindi in the room. Her right leg above the knee and two fingers on her right hand were lost during this brutal attack. It is inconceivable to imagine going through such a horrific experience, yet I will tell you these girls are survivors. These images are a testament to the special bond between these sisters and the resolve they have to be more than a statistic and bound by this life experience. They are sweet girls with dreams and aspirations to continuing their education being the teenagers they are. The NGO African Millennium Foundation (AMF) raised funds and leveraged connections to bring Bibiana to the US to be fitted for a new prosthetic leg. Their story is powerful and has inspired others to action like 13-year old Naria Slann who established a fundraising effort called “A Sisters Village” to raise funds to send these girls to boarding school in the US in order to ensure that they have an opportunity to fulfill their dreams without the fear they experience at home. Go to the link below to provide your assistance to this worthwhile cause. Hello my name is Kathleen Gerber and I am excited to share with you highlights about my recent journey to Mozambique where I assisted African Millennium Foundation (AMF) and their partner Reencontro to install a fresh drinking water well. This well was installed outside the small town of Maluana at the future site of a sustainable village designed to expand and enrich the children’s lives who have been orphaned by the AIDS pandemic in Mozambique. This project is known as “A Nossa Casa” or “A Home for US.” This well also has an immediate and positive impact of enhancing the local villagers’ lives by lessening the women and children’s efforts and struggles to gathering water. In the words of the late great Nelson Mandela “Water is central in the social, economic and political affairs of the African continent, and of the world.” While water is finally receiving it’s recognition in the US as an invaluable limited commodity, it is indescribable how linked to the wellness and welfare of a community it is throughout Africa. I have provided hundreds of hours of volunteer support evaluating the hydrologic conditions in Mozambique along with specifying the drilling requirements with local drillers to successfully construct this well. Even with all this preparation, it is a whole different world drilling a well overseas on the African continent. The equipment for this project was old, run down, and quite small by US standards to install a well over 200 feet deep. Other considerations I did not account for included that there are local customs associated with installing a well in that a ceremony or blessing is required. So before we could start the drilling we were off to the local market to get the requested supplies of a couple of live chickens, porridge, wine, sodas, and money. Other impacts to the project included political factors – for instance November 20th was Election Day and all businesses were required to shut down and not work so that their workers were ensured an opportunity to go to the poles and vote. After multiple breakdowns and repairs, unplanned delays, and even weather I am ecstatic to share that we were successful with installing a fresh drinking water well that is screened within a sandy interval to a depth of 68 meters or 223 feet. During this phase of the project we installed a hand pump, which is easy to use and maintain. At a future stage of the project this pump can be changed out when the water needs of the community expand. Most of my preparations for this project and going to Mozambique focused on the well, drilling conditions, photography, etc. I also paid a lot of attention to general travel arrangements as my mother came to share this adventure with me. What I did not think about too much on the onset was the rest of our experiences in Mozambique. The people I met along this journey were simply amazing. Everyone I met contributed greatly to our overall experience. There is something about hanging out under a shade tree for hours on end with Olinda Mugabe, founder of Reencontro, discussing topics ranging from the children that are positively affected by the efforts of her organization, to the native plants and fruits growing on the property, to politics, community, and family. She is an inspiring woman and when I asked her how she can keep up with all the projects she is involved with – she answered “children are there...and they need our help…somebody has to do this very hard work!” She also proved to be the link with the local community for my mom and I. The local community assisted by reaching out to us and was truly appreciative of the well going in. In addition to checking in on us when we were at the jobsite, they often brought us local vegetables and fruit found on the property. I learned to enjoy and appreciate the sweet yet tart refreshing taste of the local Masala fruit. And one day we were surprised by having lunch prepared and brought to us which consisted of a local plant called cacana, which is high in iron content, mixed with peanut powder – both grown in Evelina’s field. My mom and I have so many wonderful memories, experiences and friendships created from this trip – it will truly take us a while to describe to others what a powerful experience giving back to the community is. We are so thankful and appreciative to everyone that welcomed us and encouraged us along the way. This image consistently brings back vivid memories of a Maasai village I visited on the outskirts of Amboseli, Kenya. I love the juxtaposition of the vibrant colors the villagers were clothed in with the starkness of the landscape in this very dry region situated in the rain shadow of Mt. Kilimanjaro. “The Gathering” is a series of framed photography and art cards from my journeys to Africa. Several of these photos have received awards and/or been featured in international exhibitions ranging from St. Petersburg, Russia, Paris France, to Buenos Aires, Argentina! All proceeds from the fine art purchases go towards the "A Nossa Casa" a project of the African Millennium Foundation in partnership with the local NGO Reencontro designed to create sustainable futures for children orphaned by the AIDS pandemic in Mozambique. I have chosen specifically to donate proceeds towards the installation of wells and water distribution systems to provide clean drinking water to the project and the local community. All proceeds from this project will go towards development of the water supply system for this village.